First, you will see the famous Fenice Theatre from the outside. Fenice Theatre is the world renowned opera house, which was completely destroyed on 29th January 1996 by an uncontrollable fire, which entirely burned down the building. Venecians still mourn this dreadful day. However, the theatre was reconstructed in the time between 1996 and 2003 following the motto "the way it was, where it was". 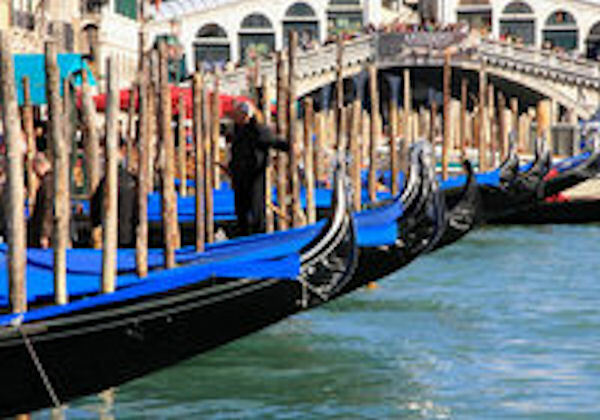 In order to celebrate the re-opening of Fenice, the city of Venice organized a series of special events and concerts in 2003. Most notably, Riccardo Muti opened the Inaugural Week in the newly renovated La Fenice Theatre, with the Orchestra and Choir of La Fenice theatre on December 14th 2003. In the audience among others was the President of the Republic Carlo Azeglio Ciampi and the event was broadcasted on national television. Following, we will pass by the Palazzo Contarini del Bovolo, which is a Gothic construction in Calle della Vida. The building shows a high variety of arcades and a parapet with little columns that follow the salient line of the staircase. Due to its wonderful exterior, the Palazzo Contarini del Bovolo is often considered to be one of the architectural jewels of Venice. Intriguingly, the Palazzo is hidden at the interior of a small courtyard very close to Campo Manin. It dates back to the year 1499. It reflects the typical Venetian character of the period, where first elements of Renaissance merge with the techniques of Gothic-Byzantine. You could not have a walk through Venice, without seeing the Rialto Bridge, which is the most famous bridge across the Grand Canal and possibly one of the most famous bridges in the world. The Rialto Bridge in its present form was constructed from stone arch by Antonio da Ponte between 1588 and 1591. Its structure is formed by two inclined ramps, which are flanked with shops on each side and covered by a portico. There were severe difficulties during the construction of the bridge, mostly deriving from the statically instability of the construction and the height of the sea bottom. Please Note: During the summer period the tour will have first the walking tour and after the gondola ride while during the winter period tour will have first the gondola ride and after the walking tour.